There was no wisdom Talitha could offer to her Master. No words of comfort that would allay either of their fears. They just had to press on, doing what they were doing. Hoping for the best was how the young Twi’lek had survived Korriban. That and a determination to keep living, no matter what happened. She had already lost so much in her life – her family on Ryloth, her freedom to the Hutts and then the Empire, her dear friend on Korriban. To think her Master was now in peril was proving difficult for her to handle. Restita herself had taken to pacing the central lounge of the XS Freighter and periodically stopped to check her datapad before resuming her fruitless walking. “I think you should go meditate, or do something to empty your mind for a a few minutes. Your pacing is driving me crazy!” Talitha grumbled from her seat. Startled at the sudden voice of her Apprentice, Restita stopped and looked into the eyes of her Twi’lek student. She opened her mouth to say something and then shut it again, before nodding and making as though to go into a side compartment. Not for the first time, her Master’s shoulders sagged as she placed it on the small round table Talitha was sat at, before shutting herself in an ajoining room. 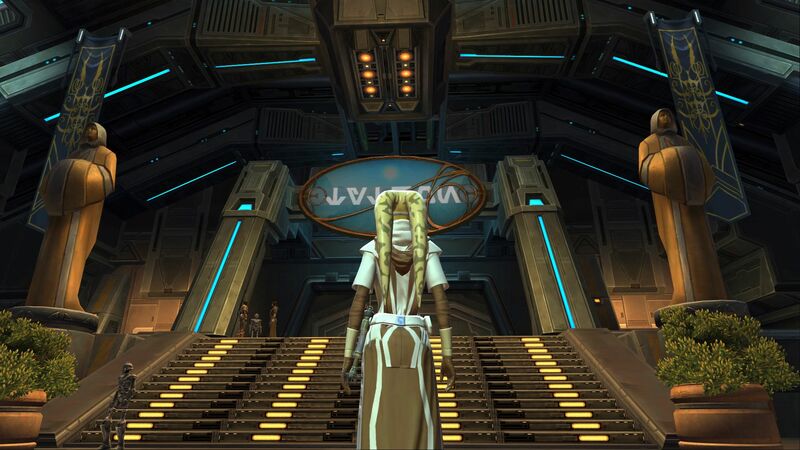 Talitha flicked on her own datapad and loaded up the notes she had taken while on Dromund Kaas. So much of it was redacted – censored from public access, or hidden behind Imperial Intelligence security systems. Why was so little about her available, when there was clearly a lot of information on file? She sighed, closed her eyes and leaned back on her chair, falling into a restless sleep. “Heads up folks, we’re nearly at Tython!”, Ric announced, happy that he would receive the other half of his payment shortly. Talitha was jolted awake. She rubbed her eyes and willed her legs to move, dragging her tired body to the bridge. If “bridge” is the right terms for this cramped, windowed, cupboard!, she thought resentfully. “Coming out of hyperspace in three, two, one…” Risha reported professionally. The white lines of hyperspace pulled back into starry formations and Talitha took a sharp intake of breath. The blue and green planet seemed so full of life, calling her to enjoy the natural, living Force. 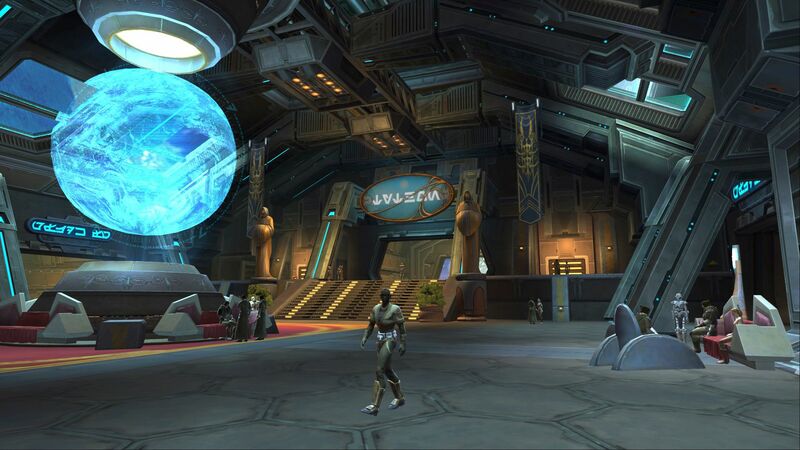 After the sands and dust of Korriban and the stormy and highly populated world of Dromund Kaas, Tython felt unreal. Talitha glanced behind her and saw Restita just standing there. 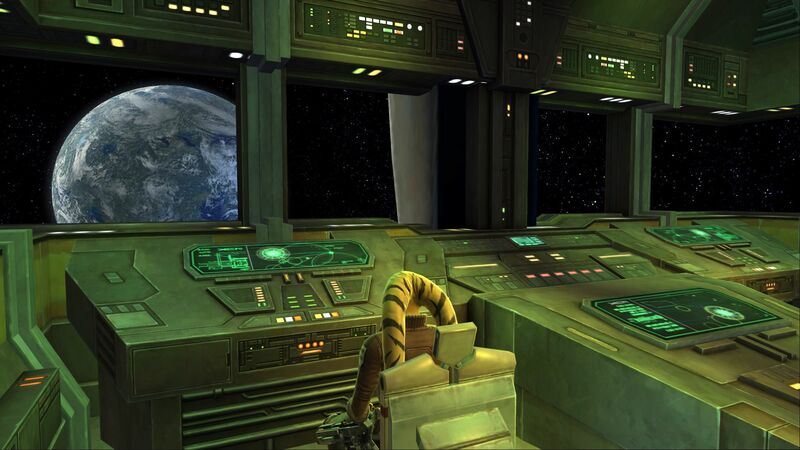 The Twi’lek wondered how long her Master had been on the bridge without her realising it. The space station was approaching as Risha guided the freighter towards an open hangar. “The rest of your payment will be in your account shortly. I just authorised it now that we have Holonet signal again.” Restita assured him. “Happy to do business with you girls,” Ric drawled, casting an inquisitive look at Talitha, who quickly glanced away. The Twi’lek and her Master returned to the central lounge and retrieved their bags. Talitha had decided to change into her Jedi robes at the space station. The freighter set itself down somewhat less-smoothly than any on-board would have liked and the shield closed behind the craft, allowing the hanger to be pumped with oxygen and for the air pressure to adjust. Once the red warning light on the command console turned to green, Risha entered some more commands and a loud snap-hiss announced the door and ramp were ready for the disembarking passengers. Ric pushed past Talitha and Restita to make sure the ramp had, in fact, worked this time. He didn’t see Talitha tilt her datapad in his direction and push a button on its side. I will get to the bottom of this, she thought determinedly. With final farewells made, the pair made their way down the ramp and into the main concourse of the space station. Various passengers and droids were milling around, but they seemed to move more steadily and calmly than those at Nar Shaddaa’s. A few folks were sat on benches and chairs, talking in hushed tones. The Twi’lek excused herself and nipped into the refresher rooms to change into her robes. The material felt coarse against her skin, but having survived Korriban, a little rough material did not bother her. She also retrieved the precious pieces of lightsaber hilt from her pack and stowed them in an inner pocket of the robes. When she emerged, her Master strode in the direction of the public shuttles, which lay beyond an enormous doorway, flanked by solemn Jedi statues.